This is a basic guide to using Git for T3D contribution and development. When should you fork and when should you clone? Cloning is when you need a local copy of a remote repository. You should not clone if your intention is to push your changes to a remote repository. Forking is for when you need to create copy of the repository on GitHub, which you can make changes to and merge those changes in to the official repository. A fork generally required to make an actual pull request on github. If you haven't created a fork yet, we'll do that first! When you want to fork a repository, you do it over the GitHub website. Simply go to https://github.com/GarageGames/Torque3D and press the "fork" button. For example mine is located at https://github.com/lukaspj/Torque3D. If you haven't set up a local repository or created a separate branch to do your work in to keep it separate for your PR, do that now by following those links. Naturally, you need to implement whatever changes you want the Pull Request to contain. Once you've finished making your changes, you need to commit them to the branch. In order for a Pull Request to be made, you need to 'Push' the local branch with your commited changes to your github Fork. In order to do that, click RMB and expand the Tortise Git -> option and find and click 'Push'. Make sure the Local branch field is the one with the changes you want to make a PR for, and put whatever you want in the Remote branch field(though ideally you name it so you know what the branch is for). Lastly, select the Arbitrary URL option and put the githb URL to your github fork(which should look like https://github.com/YourUserName/Torque3D.git) then click OK. It'll prompt you for your username and password. Put those in and it will push the changes to a branch that you named(in the Remote field). If the branch doesn't exist already it'll make a new one for you. It then prompts you if you want to make a Pull Request. Cancel out of that, as we'll do the PR itself through github. Go back to your github page, and using the branches drop-down, select the branch you just pushed and then click the New Pull Request button next to it. Here, you'll see a comparison between the selected branch and the development branch of the main Torque3D repository. Type in the name of the Pull Request(please, make sure it explains what the PR is) and a description. Lastly, select any labels that are relevant such as Bug/fix or New Feature. Then, click Create Pull Request. This will create the pull request on github itself, and the Steering Committee can tag it and process it as appropriate. If you'd like to help out further, you can find other existing Pull Requests and test them. This tutorial is aimed towards Windows developers, but I don't see why it wouldn't work for Linux or Mac as well, aside from minor differences in terminology. And then press enter, if it says the command was not recognized, then you probably haven't set Git up properly. 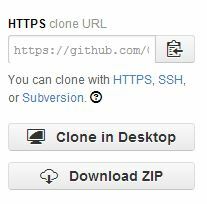 Cloning a repository is really easy. 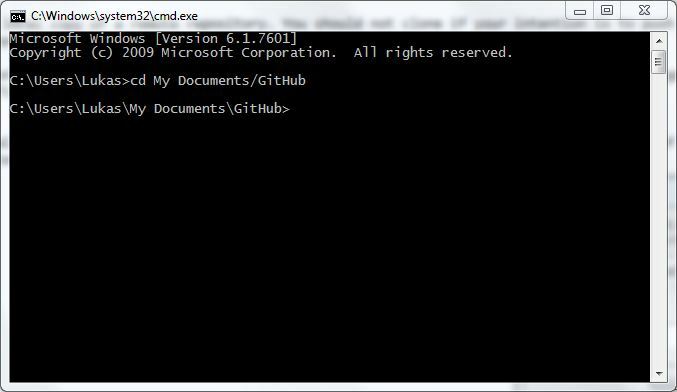 First open a command-line window, and navigate to the parent repository of where you want your repository to be downloaded to. (e.g. C:/Users/Lukas/My Documents/GitHub). Just press enter, and you are done! 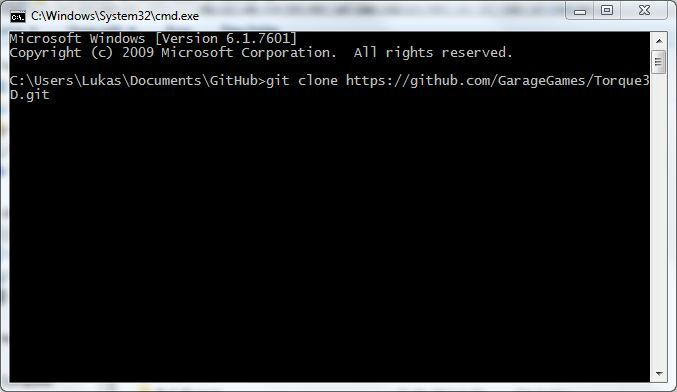 It will now clone the repository into a new folder called "Torque3D". To get a local copy of your repository you will have to clone it as explained earlier, except this time you shouldn't use the URL for the Torque3D repository but instead the URL for your own repository, which you can find by going to your repository on GitHub.com and find the box that says: "HTTPS clone URL" and copy the link inside that box. If you want to contribute bug-fixes or other code to the T3D repository, then you should be familiar with the procedure for doing this. So lets go through this procedure step-by-step. Branches are basically different versions of the same base code. When you create a new branch, you can edit it all you want, then checkout master and nothing will have changed. It is good practice to create a branch for even the smallest change you make, this makes it easy to track, and undo changes if an issue arises later on. Where new_branchname should be replaced by the name of the new branch you want to create. Where branchname should be replaced by the name of the branch you want to start working on. Where remote_branchname should be replaced by the branch on the remote repository you want to push to (typically this will be the same branchname as your current branch, if you use the same branch name then GitHub will usually create that branch for you automatically. Now you just need to make the changes to the code! Fix the bug, add the feature, whatever your intention with the branch was. When you are done modifying the code, you need to commit the changes before pushing them. Now that you have added the files, you can now commit them by using the commit command. This will add all the files you have changed to a new commit, you can use the -m modifier if you only have a short commit message which you can write directly in the console. git commit -m "Wow new feature that does this"
Assuming you have successfully pushed the commit to the online repository, you should now be able to do a pullrequest. 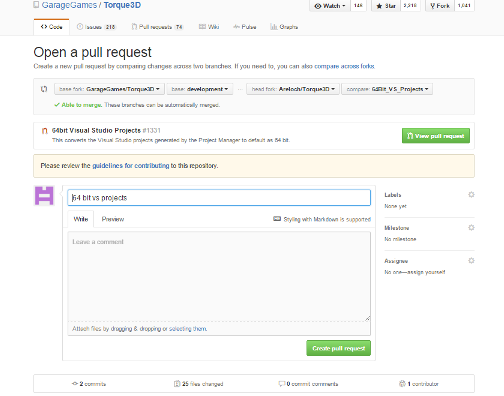 Pull Requests are done through the website, and are very simple to perform. Go to your online repository and press the green Compare and review button. Now you come to the compare page, on this page you can compare your repository with the official one and create Pull Requests from a branch in your repository to a branch in the official one. Now to actually make the Pull Request, click on the large button that says "Click to create a pull request for this comparison"
The dialog that then pops up will feature a title and a description. Here you should describe all the commits that your pull request involves! (If you only have 1 commit, copy-pasting the information from that commit will be fine) along with a "how to use" (or "how to replicate the bug this PullRequest fixes"). Then you just press "Send pull request" and thats it! Now you just have to wait untill the PullRequest is accepted/rejected and act accordingly. Be sure to be ready to help out if there is some issues with the PullRequest. Make sure to checkout the guidelines below. New changes should always go into the development branch before they go into the master branch, this is because they need to be QA'd before going into the Master branch. If you don't pullrequest to the development branch, your pullrequest will be rejected. If you have a branch this fixes feature "x" make sure that, that is all it does. Don't do a pullrequest that does anything else than what it says on the label. If there is a bunch of redundant changes in the branch, it will make it hard to track those changes later on since it's hidden under another pull request. So most likely your pullrequest will be rejected if this is the case. If you have a commit that fixes the issue, and then 5 commits to fix various mistakes / typos, you will be better off removing all the commits and then do a new commit, this will be much cleaner and easier to manage. You can look at the Troubleshooting section for how to remove a range of commits. This is general quality-of-life hacks that I have found very useful, I cannot guarantee that this is the 'official' way to do it, but for me it works. It's that long string of numbers and characters that makes up the id of the commit. If you have made a mistake and want to undo the changes made in a commit you will use the git reset command. This modifier resets the repository to an earlier stage, but does not undo changes to the files but instead marks them as "to-be-committed". This modifier resets the repository to an earlier stage AND undoes all changes made to the files. If you want to remove the commits themselves and not just revert the repository to an earlier stage (e.g. to make a clean PullRequest with just 1 commit), then you will use git rebase -i. This will open up a text editor with options for what to do with each commit, if there is some commits you want to merge together, use the "squash" option to merge them together. To make the Elastic ease fix commit be merged into the previous commit, New readme for v2.0.